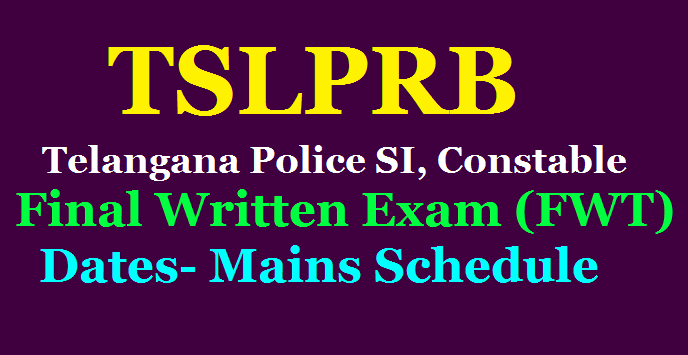 TSLPRB Telangana Police SI, Constable Final Written Exam (FWT) Dates 2019 Released : SI Constable Final Written Exam Dates schedule 2019: Telangana State level Police Recruitment Board Released Sub Inspector Constables Final Written Test Dates for the candidates to who have qualified PMT TSLPRB Witten Test Dates announced. TELANGANA STATE LEVEL POLICE RECRUITMENT BOARD DGP OFFICE COMPLEX, LAKDI-KA-PUL, HYDERABAD Rc Nos. 88, 89, 90, 91 / Rect / Admn-1 / 2018 Date: 11-03-2019 Telangana State Level Police Recruitment Board issued Notifications on 31-05-2018 for direct recruitment of 1,217 vacancies of SCT SI Civil and / or equivalent Posts, 29 vacancies of SCT SI IT&C, 26 vacancies of SCT ASI FPB and 16,925 vacancies of SCT PCs Civil and / or equivalent Posts, 231 vacancies of SCT PCs Technical (IT&C, PTO Drivers and PTO Mechanics). As per the Recruitment Procedure, Preliminary Written Tests (PWTs) were conducted on 26th August 2018 for SCT SI Civil and / or equivalent Posts, on 9th September 2018 for SCT SI IT&C and SCT ASI FPB and on 30th September 2018 for SCT PCs Civil and / or equivalent Posts. On the basis of these PWTs, Candidates who qualified to participate in the next stage of Recruitment viz., Physical Measurement Tests and Physical Efficiency Tests and all those Candidates who applied for the vacancies of SCT PCs Technical (IT&C, PTO Drivers and PTO Mechanics) are being administered Physical Measurement Tests and Physical Efficiency Tests (PMT / PET) from 11th February 2019. Amberpet, Yousufguda and Kondapur in Hyderabad, Warangal, Karimnagar, Khammam, Mahbubnagar, Nalgonda, Adilabad, Nizamabad and Sangareddy have been the 11 Venues for the PMT / PET Process which will be concluding by the end of March. Candidates have been performing very well during the last 3 weeks and though it is too early to compare, it appears most likely that the overall percentages of qualification in the present PMT / PET will be nearly 5-10% better when compared to those that were recorded during the previous Recruitment that took place in 2016-17. As on date, 99.6% of the Performance Sheets have already been hosted in the login area of Candidates on the TSLPRB Website www.tslprb.in. Those Candidates whose Performance Sheets are held-up temporarily for technical or data-inconsistency related reasons, are informed that all the pending 0.4% Performance Sheets are being hosted gradually after due resolution of technical or data related issues if any and all of them will be hosted latest by the time of conclusion of the PMT / PET, well before the Hall Tickets are issued for Final Written Examinations.